First the pool, now cement. 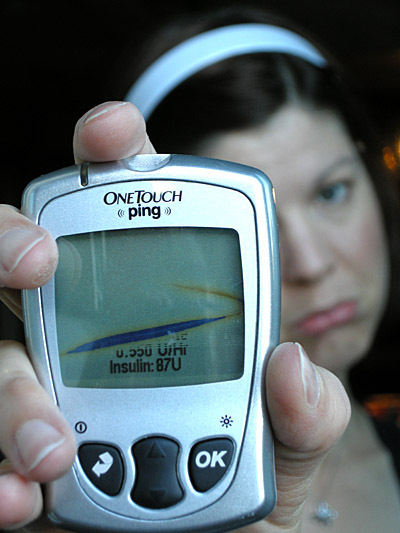 Oh man, my insulin pumping system hates me! A few months ago I discovered my insulin pump wasn’t actually waterproof (as was advertised by Animas) after submerging it into a pool for an hour. On Sunday, I discovered my blood glucose monitor, which connects to the pump, isn’t made of titanium, nor does it have an invisible protective shield around it. Seriously, some one should get on that. Mario and I had just finished dinner out on the patio and after lingering in the dwindling sun for a awhile, we begrudgingly started to pack up. Mario grabbed his dinner plate and I think maybe a side plate, but me being the efficient packer upper that I am (or just lazy) I stacked three plates for one hand, two glasses in the other hand, with cutlery inside the glasses, and then I grabbed my glucometre and slotted it between the plates and my fingers. Bad move. Bad, bad move. Not even a second gripped in my fingers and my metre was falling to the ground, the cement ground. Smash. Batteries went flying. That’s not good, I thought. Nope, not good at all. I called the Animas hotline, left a message, and within the hour they had called me back. They asked a few questions and then told me they could send a new one out by Purolator, but it would take a few days. Did I have another metre? Sure, I said. I had tons. Before going on the pump, and using this one special metre, I had a stock of like three or four metres at one time. No big deal. About an hour or two later, when Mario and I were about to sit down for dessert, I went searching for one of those metres, sure it was in the same cupboard as all my other diabetes supplies, but could not find them, not one of them. I searched upstairs. I searched in the wardrobe, the closet, the desk, the storage compartments, old purses, old fuel belts, but nothing. Oh crap. Keep in mind this was on Sunday and it was now 9:30 p.m. – where the heck was I going to find a pharmacy open that late? Shoppers Drug Mart. 24-hour pharmacy. Ka-ching. So what did I learn from this experience? That as in control of this disease as I appear to be and try to be, I will never be independent of it. When I realized I didn’t have a metre on hand, and feared I wouldn’t be able to find an open pharmacy, I was seriously so close to breaking down. I could not go the night without knowing what my blood sugars were, and then the following morning, how was I to determine how much insulin to give myself for breakfast without knowing my blood sugars? What if my blood sugars went low, how would I know? What if they were high? Yes, our body’s give us signs to let us know when things aren’t right, and years ago I would have been okay with relying solely on those signs alone, but that was before I took on the challenge of perfecting this damn disease. And the downside of better control, it seems, I’ve developed a major dependency on the damn glucometre! Bah! Sunday’s run was one of those runs. You’ll note above that I tested my blood sugars an awful lot on the run, which I will admit has been rare for me on long runs lately. But given that my bladder seemed to never want to feel empty – for the entire 17 km!!! – I had ample time to test at the multiple washrooms stops I made. Not one, not two, not three washrooms – but four washroom stops! Are you kidding me? Not even Mother Mary could save this run from bladder hell. This entry was posted in Diabetes, Running and tagged Animas, blood sugars, broken glucometre, running with a full bladder. Bookmark the permalink.